Thursdays are hard, right?? We are well into the week, but still have a fair amount of work to do before the weekend... sometimes it feels like it will never end! So, to lighten up the mood, I thought it would be fun to check out a couple of our more lighthearted cakes! Above is a cowboy themed 1st birthday cake. 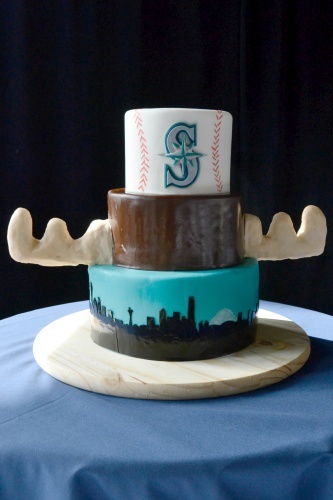 Below is an Operation Game birthday, a breakfast themed cake, and a Seattle Mariners themed wedding cake (the couple were married at Safeco Field! ).